The decision by NSW Office of Sport to suddenly and immediately close Myuna Bay Sport and Rec centre was based on Origin Energy’s advice that a large earthquake could fracture its ash dam wall at Eraring. Geoscience Australia - the federal agency which measures that risk - says the chance of a 5.9 magnitude quake occurring within 100km of Myuna Bay is “one in 5000 years or longer”. Putting kids on school buses is a greater risk, but we don’t suddenly shut them down! It's a complete overreaction in my opinion, which must be reversed. "The federal government agency responsible for geoscience in Australia says an earthquake of magnitude 5.9 por above could occur once every 5000 years or longer in Lake Macquarie. 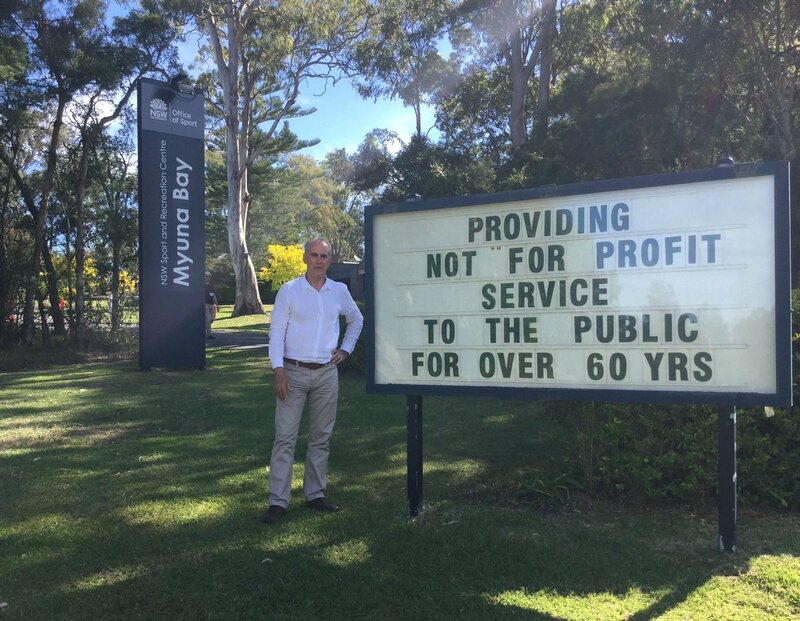 Geoscience Australia's advice casts doubt on the closure of Myuna Bay Sport and Recreation Centre, according to Lake Macquarie MP Greg Piper. It comes as the NSW Office of Sport presented relocation or redundancy options to staff because risks from Eraring power station's ash dam can not be rectified nor a new centre built nearby within two years. Mr Piper said there was a "greater risk of putting your kids on the school bus" and the closure was a "complete overreaction". Eraring power station owner Origin Energy has said an engineering review found the stability of the station's ash dam could be "affected in the event of a major earthquake". It "recently" informed the Office of Sport, which shut its nearby centre on Friday, putting about 20 staff out of work and ending nearly 70 years of activity at the site. The closure, which has been described as a "knee-jerk reaction", has been met by condemnation and confusion in the community. "Origin said this problem would arise only in the event of a 5.9-magnitude earthquake," Mr Piper said last week, recalling a meeting six months earlier when Origin Energy said its review was "precautionary only". Geoscience Australia told the Newcastle Herald that eight earthquakes over magnitude 4.5 had occurred within a 100km radius of Lake Macquarie since 1841. It provided a list of seismic records for the region, citing 44 earthquakes in a 173-year period over magnitude 3.0. "While there are a number of moderate magnitude earthquakes observed in the region, we might expect that a large magnitude 5.9 earthquake could occur in the region approximately every 5000 years or longer," the agency said in a statement. Geoscience Australia said the 1989 Newcastle earthquake, the largest ever in NSW at 5.6, was the exception for large quakes in the region. "The Lake Macquarie region has a long history of moderate-to-large earthquakes, with the 1989 Newcastle earthquake being the most notable," it said. "Moderate earthquakes are considered to be those that are widely felt and large earthquakes are ... those that would cause damage." The agency noted the importance of ground-shaking intensity in an earthquake. "The more important factor for any particular location is the ground-shaking intensity that could potentially be exceeded," it said. "Buildings and other large infrastructure are typically designed to withstand a particular level of earthquake ground shaking. "This ground shaking level could occur (or be exceeded) for earthquakes with a range of magnitudes, depending on the relative location of the earthquake to the site (or structure) of interest." Origin said in a response to the Herald its engineering report was completed in March and it had "acted quickly" to inform the Office of Sport. "The Earing ash dam was assessed for its ability to withstand a one in 1000 earthquake (approximately equivalent to 5.7 on the Richter scale), which is a requirement of the guidelines developed by the Dam Safety Committee under the Dam Safety Act 1978," a spokesperson said. "While the likelihood of an earthquake of this scale is low, the consequence would be significant. "Origin is now developing detailed designs for works to strengthen foundations and the embankment around the ash dam and these works are estimated to take between 18 and 24 months. "We will continue our discussions with NSW Office of Sport on alternative measures to address the closure of the Myuna Bay Recreation Centre, which include possible relocation to a new facility at Origin's expense."